“80% of your results come from 20% of your efforts” this postulate is earning a great value in modern working culture, this is possible if time management is thoroughly induced into your work regime or ethics. In the current scenario, where you try to steal time in-between a tick of a second, managing your 24 hours is a big thing where every second count. At a lower level, many companies including events are raw in their basic business process this is because either they are less aware of the benefits of time-management or they are reluctant to leave their traditional business model. 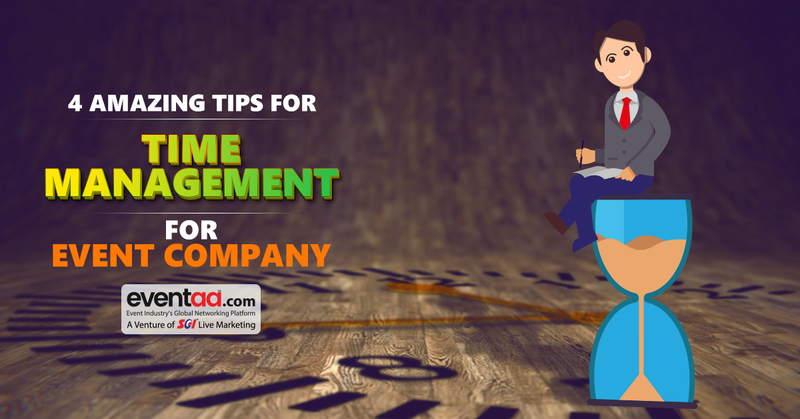 The only solution to streamline the event business is to inherit proper time management. Every goal you determine to achieve has time-frame attached to it. Reminding consistently about your objectives to keep you on toes to complete your task at a specific time and bring closer to your goal. The most important time of your day is the time you schedule your daily tasks. It is a natural human instinct to go after low hanging fruits first, which is a good approach when you have multiple tasks to complete. Sometimes it’s better to go after difficult tasks first as it relieves you from the frantic work jitters as well as gives free time in the end to introspect. Eliminating “time wasters” is the key to bargain bonus time on your pending task. But at the tick of a time, you should have something in hand and if you fail to achieve that it’s better to hit one target at a time. Punching document in a proper manner saves your time that is usually wasted fiddling around and locating at that point of time. Some quick tips to file your documents in an organized manner are ---- store related documents together, avoid saving unnecessary documents, follow consistent method for naming your files and folders, separate ongoing work from completed work, avoid overfilling folders, etc. In your free time, you can go back and evaluate the sheet to check which activity takes more time and the one which can be aborted. Technology is leverage for event people.Using them wisely can save a lot of time and cost, for instance, conducting meetings with clients, caterers or business partners through Skype or WhatsApp. Apps, APIs, and web-based applications can be invaluable time savers if you know right product for your purpose. You can use tools like “Zoho” or “Salesforce” to manage, allocate and track work of your team remotely. Have you ever experienced an improvement in your existing business after inculcating any of the above tips? Do you have views beyond these tips which can further streamline the business process?